Sowed this summer but with hardly any flower seed thtough the grass mix the flower seeds have germinated quite well and more importantly the grass hasn't needed to be cut. The area is rougly fifty by ten metres. I now need to add more seed . but the question is whether to wait until the present flowers seed, which will probably be into October, or lose some of what is there and cut earlier to prepare for sowing.in September. Alternatively to wait for spring sowing. The reasons why the grass hasn't grown strongly are compacted ground, shallow soil depth and some of top soil was removed over part of the area. A lot of thistles grew but these have been removed by hand. There is a reasonable chance that new seed will also germinate and survive but I need to select varieties that can survive cutting during the season sometimes in the longer term. just to keep it reasonably tidy. Any ideas on when to sow.? I have a spring tine harrow to help prepare the ground. The photograph makes it look better than in reality because the scene is compressed but there are still new flowers appearing, mostly poppies now. Everything is later than normal. the mix you sow will depend on your soil type for the moment cut it down and leave to lie for seed to fall out then remove stems and grass you can over sow it next spring again if needs be. i will check out suppliers if your interested and post links here. Areas that had little wild flower can be prepared and sown again. Do not feed or fertilize soil. 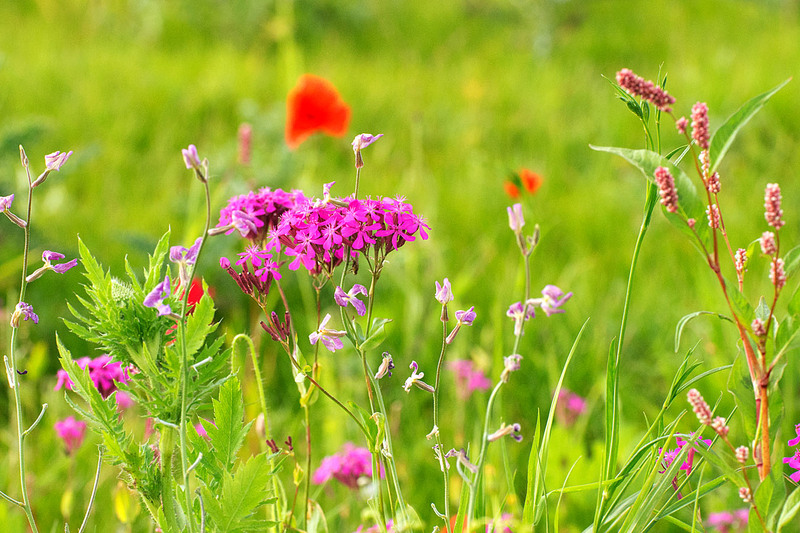 you should mow your wild flower meadow twice a year, in early spring and again in late September. It probably does make sense to leave the present flowers until they all seed. Even though there are so few their sedd is more likely to germinate. I will probably add some other seed in late autumn if conditions are OK and more seed in the spring. I can cut the grass and lift the grass clippings separately with the mower so that should scatter the seeds a bit more.. Inevitevely the background weeds and stronger grasses are going to dominate so it is always going to be a bit of a compromise but part of the reason for the excercise is to encourage insects and birds for photography. Even if it looks a bit rough it will still do that.. I think it looks good djh, and so much more interesting than a boring old lawn. with the price of petrol for lawnmowers at present I'd say there will be a lot more following you in future.